Holiday meals, special events, and seasonal shows, for starters! How will you see all the attractions AND take in the extra festivities in your already jam-packed vacation? We’ll guide you through the holiday offerings (not just the food!) so that you can choose your favorites! Pre-order our 2019 Holiday Guide today and start your planning NOW! 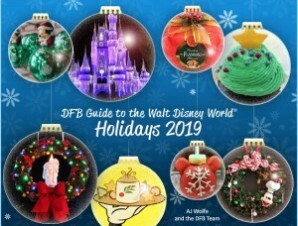 The DFB Guide to the Walt Disney World Holidays 2019 e-Book has the very best advice, information, and tips to be sure you enjoy the holidays to their fullest at Walt Disney World! With more than 400 pages of seasonal material and over 350 photos, you can plan ahead so that upon arrival at the Walt Disney World resort you can get right to the celebrations. With traditional festivities and new entertainment this year; we illuminate the way so that you don’t miss any of the merrymaking! 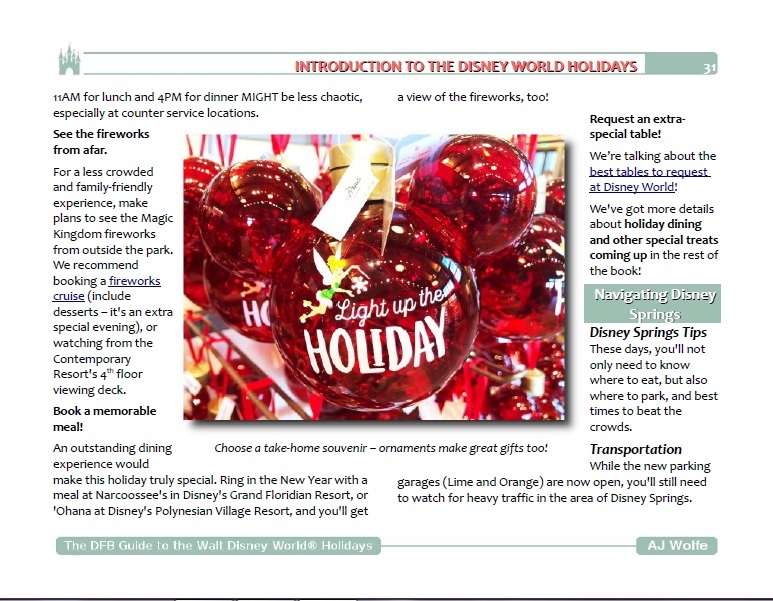 The DFB Guide to the Walt Disney World Holidays e-Book is more than 400 pages of in-depth information, including significant crowd-avoiding tips and information on where to dine when the restaurants are booked solid! If you’ve toured Walt Disney World during the busy holiday season, you know how important these details are. We’ve noted all of the restaurants offering special meals or menu items, new shows, and more! Plus, we’ve designed a FAQ section and fun bonus items (including holiday-inspired crawls and touring strategies)! 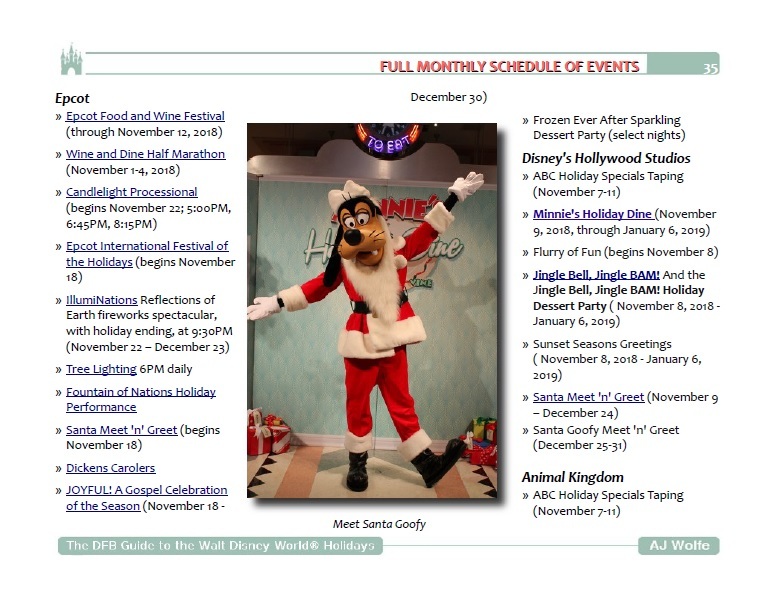 We’ve even added a brand new section featuring Disney holiday recipes. The holiday season at Walt Disney World is here! The extra festivities can be overwhelming, but by pre-planning, you’ll be able to choose the events, shows, activities and meals that are most important to you and create a strategy to make sure you experience them all. We’ve also noted new elements that you’ll find at Mickey’s Very Merry Christmas Party, Jingle Bell! Jingle BAM!, and the Candlelight Processional. Don’t arrive home and realize that you missed an activity that would have been a memorable moment for your family! Plan Your Dining Ahead of Time With Our Exclusive Holiday Dining Information for the Parks and Resorts! 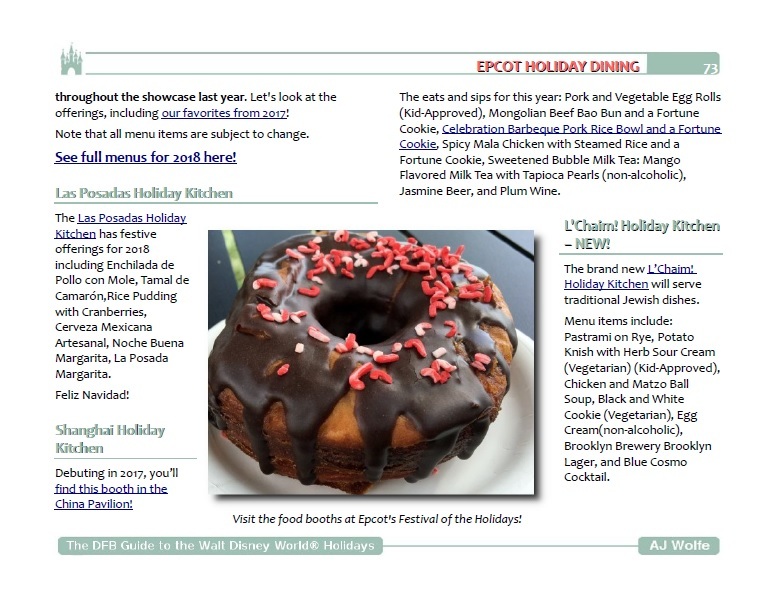 We’ve included in the DFB Guide to the Walt Disney World Holidays e-Book a full breakdown of the restaurants that we recommend and information on every restaurant offering a special holiday meal! This extremely valuable, exclusive resource allows you to easily plan your meals, see what’s offered, and be ready to book reservations — just like that! Use it on your mobile device when you’re at Walt Disney World to see what restaurants may have last-minute availability! Don’t Waste Money or Time On Events and Activities that Don’t Interest You! You’ll have instant access to every event and activity in Walt Disney World, including event information, prices, and photos. By choosing your must-sees before you get to Disney World, you’ll save time, money, and skip the stress! Our exclusive and customized bonus sections will help make your holiday trip your best visit ever. Take a look before your trip to decide what events and activities your family will enjoy, then book early to make sure you’ll be one of the fortunate attendees! Time is money on a Disney Vacation; get the most out of both! Learn Tips to Avoid Endless Lines and Enjoy the Seasonal Celebrations! It’s always busy during the holiday season at Walt Disney World as this destination is well-known for high quality entertainment, memorable decor, and fantastic food. But each year the seasonal events get more and more crowded, and it becomes more difficult to simply show up and try to see everything. Don’t get shut out of popular events, and don’t wait in winding lines! We’ve had years of experience with Disney World’s holiday season, and we’re excited to share our most exclusive information! Remember, if you only have a few days (or less) to spend at Walt Disney World, you want to be sure you’re making the right choices! Thousands of people use AJ’s Disney dining advice every day, so you can feel confident that your plans are in safe hands. If you don’t feel the DFB Guide to the Walt Disney World Holidays e-Book is worth the price, just let me know within 30 days and I’ll refund your money. As you can see I’m very confident that you’ll be thrilled with the guide and get many times your investment back in money savings, time savings, and more fun on your vacation. Holiday-Themed Crawls — a great activity for a group of any size or a solo adventurer! We’ve mapped out four holiday Crawls that will take you around Walt Disney World to see the best of the holiday attractions and/or food. Choose from four fun themes — or do a new one every day! There’s even one for adult beverages! Holiday Customized Touring Strategies. Will you be visiting with extended family? Going to the Mickey’s Very Merry Christmas Party? Want to see the holiday celebrations on a budget? We’ve developed customized touring strategies for these circumstances and more! A FULL Chapter on Where to Dine Without A Reservation: Christmas is C-R-O-W-D-E-D…take our advice and have a great meal away from the masses. In-Depth Look at Holiday Snacks: We’ll tell you the must-eat snacks this holiday season. Disney Park Scavenger Hunts: Add even more fun to the adventure with theme park-specific scavenger hunts.